The Masculine Mandate: God’s Calling to Men, Richard D. Phillips, Orlando: Reformation Trust Publishing, 2010. Hardcover, 174 pages, $15.43. Back in the 1990s, it was Promise Keepers that attempted to bring men to realize their calling as men, especially as husbands and fathers. At that time, helpful critiques were offered by some in the Reformed community. In the first years of the new millennium, it was John Eldredge and his book Wild at Heart that seemed to get the attention of many men. However, it soon became evident that Eldredge had some serious theological problems. For one thing, he seemed to lean towards a heretical view of God’s sovereignty known as open theism. Open theism teaches that God takes risks – in Eldredge’s language, “…there is definitely something wild in the heart of God.” Since God takes risks (and he doesn’t know what will happen), men too should go out on a limb and be godly (i.e. God-like). It’s easy to take shots at the bad stuff that’s been put out there for Christian men. It’s obviously much more difficult to come up with a positive approach. The Masculine Mandate is a solid effort in that direction. The author’s purpose is to give clear, sound biblical teaching for men about being men. Richard Phillips is a PCA pastor in Greenville, South Carolina and the author of several other books. In a previous life, he served as a tank officer in the U.S. Army and a professor at the U.S. Military Academy at West Point. His military service certainly grabbed my attention. After all, what could be more masculine than commanding tanks? On several occasions throughout the book, he provides illustrations or anecdotes that could only be gained from someone with military experience. Yet it is the Bible that provides the foundation for everything in this little volume. One could quibble with a few minor points, but generally you’ll find a biblically sound presentation of manhood in these pages. The one point that I’ll comment on has to do with his discussion of the means of grace on pages 38-39. He rightly identifies one of those means as being God’s Word. To be transformed into Christ-likeness, we need the Holy Spirit to apply the Word of God. One would expect a Reformed/Presbyterian author to place the emphasis here on regularly sitting under the preaching of the Word of God. Instead, the only thing that gets mentioned here is personal Bible study. Were he pressed on it, I’m guessing the author would agree that regular church attendance and sitting under the proclamation of the gospel is crucial, but it’s overlooked here and elsewhere in the book and that’s unfortunate. Too often in the broader context, church-going is regarded as more of a feminine activity. Manly men belong in church sitting under the means of grace with their wives and children. 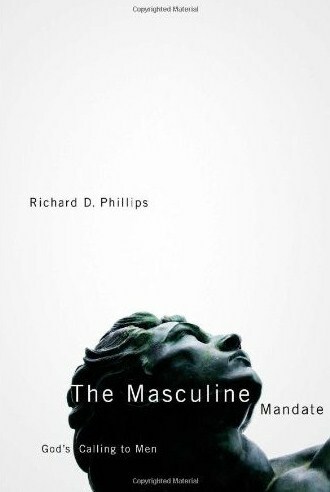 Phillips does interact some with other views of manhood. For instance, early in the book he provides a brief critique of John Eldredge’s Wild at Heart. There are many aberrant views of masculinity floating about and even where this book doesn’t address them directly, it will provide helpful biblical instruction to inoculate ourselves against them. A recent issue of The Atlantic had a cover story entitled, “The End of Men.” The article stated that there is a massive role reversal taking place in our culture. Women are now in the majority in the US workforce. Most managers in US businesses are women. Most likely similar trends are taking place in Canada. We are in the midst of a major cultural shift and we need guidance from the Bible. Richard Phillips provides that. Written with clarity, this book deserves to be read by men of all ages. Since it has study questions for reflection and discussion at the end, it could be helpful for a men’s fellowship group at church. Or perhaps a father could read this book with his older teenage son(s) and have it stimulate some good discussion about biblical manhood. It’s one of the better books on the subject. UPDATE (12/06/18): for the next six days, you download a free copy of this book from Ligonier by following this link. This entry was posted on Wednesday, October 6th, 2010 at 2:49 pm	and tagged with Biblical manhood, masculinity, Richard D. Phillips and posted in Book Reviews, Christian living, Family. You can follow any responses to this entry through the RSS 2.0 feed. « Should We Keep the Law? Kevin: thanks for stopping by. I hope the book will give edification and some good discussions. Blessings to you too! I’m not saying it isn’t a good book but for myself the masculine mandate for me would be the perfect example of Jesus Christ. Thanks for your splendid reviews. Much needed journalism!